We returned home today from our first camping expedition with the travel trailer. We went to Jellystone Park – Mammoth Cave in Cave City, Ky from Friday through Sunday. We had a wonderful time! The weather was perfect – mid 70’s during the day and high 50’s at night. 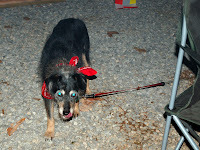 We had a full crew to test out the camper – me, Jason, Portia, Rebecca (Portia’s friend), all three dogs and the rabbit. All of the animals traveled well and did great at the camp site. Bunn had his great wall to play in outside where he could get some fresh air. The dogs had the screened in 12 x 12 tent to wander around in when they weren’t in the camper. There was a nice dog play area where we could take them off leash and let them get some run time. Since it was our first trip we figured we’d end up with a list of things that we forgot, but we actually did very well and had everything we needed. We did find that our sewage hookups aren’t the same as most “normal” travel trailers, so that will have to be fixed before Jason goes on his guys only mountain biking/camping trip next weekend. 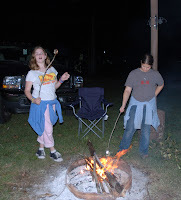 We had a yummy steak dinner Saturday night and made smore’s over the campfire. The park is very family oriented and there was lots of things for the girls to do. They played basketball, watched the ducks in the pond, hung out at the arcade and even did some homework – imagine that! The only complaint we had throughout the entire weekend was when Saturday afternoon the park employees spent three hours cutting up a fallen tree two camp sites down from us. Three hours of listening to chainsaws is not my idea of relaxing with nature. Luckily once they finished they left the other two trees for later. We’re already planning our next trip, though, and we may even head back to the same camp ground. We’re trying to get in as much camping as we can before winter gets here, forcing us to wait until next spring.